15 minutes skipping: 151 calories! 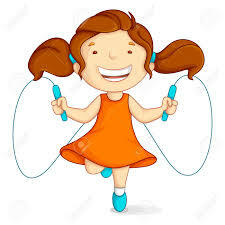 I’m a recent convert to the art of skipping (or jump rope) because when faced with exercise choices such as the above for burning calories it’s a no-brainer. Not only is skipping an activity you can do in the privacy of your own home, it also burns calories like a house on fire; 15 minutes skipping and you’re done for the day! No more pitying looks from passersby as I jog and puff my way past them on the street, no more braving the soggy bacteria colonies of the local swimming pool changing rooms, no more excuses that I haven’t got time to fit it in because 15 minutes – surely anyone can fit that in? What about ruining my carpets you ask? It’s true that you need plenty of space and a solid floor for skipping and it’s probably wise to stick to the ground floor to prevent the thud, thud, thud driving other residents mad. Gym mats are essential to cushion the impact on ankles and knees, as is removing ornaments and children from the vicinity. But beyond that skipping is really pretty simple. 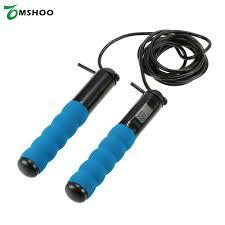 I recently was given a skipping rope with weights in the handles. Now that really is a workout for arms and legs as well as for the heart. I also have a skipping rope (apologies for turning into a skipping rope bore) with no rope, only handles. You mimic the action of skipping and the handles contain a computer to time you and keep a calorie count. Very han dy for taking away on tour. So fashionable is skipping nowadays, the British Rope Skipping Association (yes there is one) is lobbying for it to be recognised as an Olympic sport. Although originally it was considered indecent for girls to skip in case they showed their ankles, the invention of pantaloons in the 19th century meant worries of indecency receded and girls gradually took over skipping, to the extent that, sadly, it was eschewed by boys, who regarded it as sissy. I still remember persuading my mum to cut off a bit of our colourful plastic washing line so that I could take it into school and play one of the many skipping games with rhymes we used to love. It really stung if the rope thwacked you so it’s a shame but perhaps no surprise, that school skipping gradually died out due to fears for health and safety. However pro sports athletes, particularly boxers, have always kept the art going in their training sessions, prizing its benefits for fitness and agility. Even I have to admit solo skipping can get a little boring but should you need to spice things up, skippers vary the pace with double unders, cross overs, double cross overs, scissors, wounded ducks…. 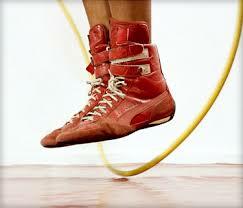 A final fact about skipping: the Guinness world record for longest marathon jumping rope was set by American, Joey Motsay, at 33 hours 20 minutes. How you even begin to do that, I have absolutely no idea!